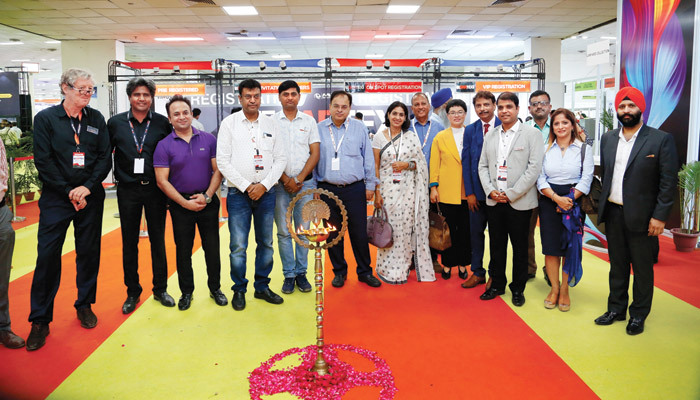 Gartex, one of India’s major trade shows dedicated to garmenting and textile manufacturing technologies was held from August 18-20, 2018. Spread over 1, 00,000 sq. 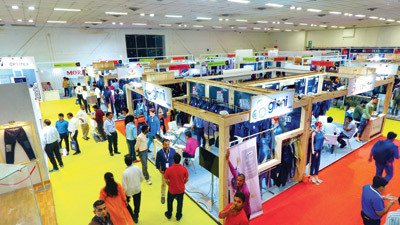 ft. of the exhibit area, the show was held across 4 halls in Pragati Maidan. More than 150 companies displayed around 300 brands. The exhibitors showcased their innovations under three major categories: DIGITEX: An exclusive focus on Digital Textile Printing Technology, Embroidery Machines: highlighting innovations in embroidery sector, and Garmenting & Apparel Machinery: Showcasing technological developments in the garment & apparel manufacturing sector. Fabric &Accessories Pavilion: Specially crafted to facilitating exhibitors dealing in fabric & accessories sectors with more focused business environment. Gartex 2018 edition provided a lot of opportunities to the manufacturers as well as buyers to get updated on new trends in technology and denim fabrics. Broad exhibit categories included embroidery machines, cutting and sewing machines, digital textile printing machines, laundry & washing equipment, finishing equipment, laser cutting machines, fabrics & accessories and softwares. 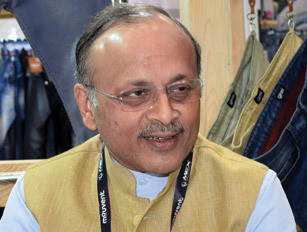 Also, this year, Gartex collaborated with Denim Manufacturers Association (DMA) of India and especially created a Denim Zone to provide a platform for denim manufacturers to showcase denim products.Along with the fabric, the show proved beneficial for the value chain of denim including a gamut of accessories like zipperand buttons. 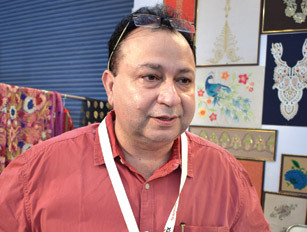 Being one of its kind, the Denim Zone provided sourcing opportunities to the designers, merchandisers, apparel brands, fabric sourcing teams from top apparel brands/export houses, garment/Jeans fabricators & manufacturers and buying houses. The show this year was bigger in terms of exhibit area and no. of exhibitors, when compared to 2017 edition. According to the exhibitors, there was a good increase in no. 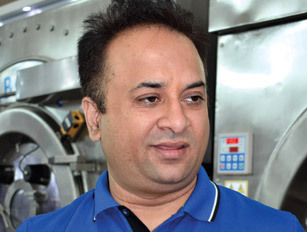 of visitors but due to low market sentiments the buyers nowadays are not willing to expand but only placing orders for the machine which they actually require as of now. However they showed good interest in the new technologies being displayed there, so there are good prospects of future order placement. 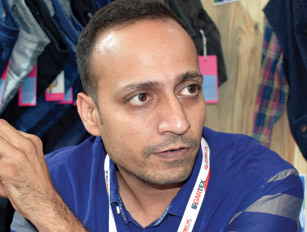 The companies showed their satisfaction over the quality of customers especially in the denim segment the turnout and response surpassed their expectations. 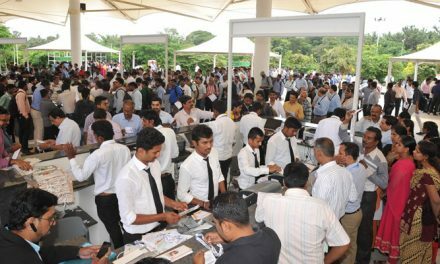 Overall, the show was termed satisfactory by most of the exhibitors. 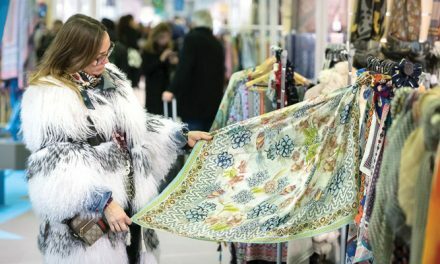 The 2018 edition of Gartex witnessed 18,100 trade visitors who amplified the spirit of the show all in a span of three days. This year Gartex witnessed targeted visitors such as garment & textile manufacturers, machinery importers & exporters, fashion designers, merchandisers, distributors & wholesalers. However, more importantly, the show also attracted business owners from smaller towns like Bhilai, Siliguri, Indore, Bhopal & Ludhiana. 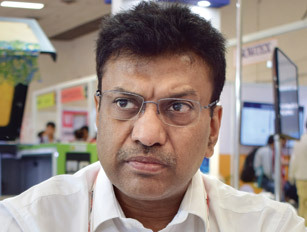 The organisers also created Denim Applications Zone within the periphery of the Denim Show to highlight rapidly increasing applications of denim fabric. Going beyond our imagination, the zone displayed denim scooter, rugs, bikers’ helmets, decorative items, home furnishings, bags, shoes, toys, car seat covers, facemasks, phone covers, upholstery, insulations, etc. to bring forth a wholesome idea that where denim can be used. The show also brought the Trends Zone to unveil the latest trends taking place in the Denim Industry to achieve a sustainable growth. The sponsors of the Zone Arvind with theme Azurite and Raymond with theme Fun and Freedom showcased their latest products; both received overwhelming responses from the trade buyers. The show also staged two different educational workshops which focused on enhancing industry skills conducted by ATDC. The workshop successfully attracted enthusiasts to participate and learn new skills that will help them grow better in this field in the near future. 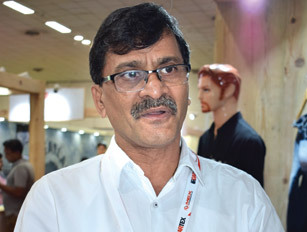 Apart from the regular exhibition, the show had Denim Talks, sponsored by Reliance Industries and Government of Madhya Pradesh was conducted on the third day of the show, focusing on the emerging trends and technology in the denim industry. The conference highlighted the innovations in design and trends besides highlighting the changing technologies on denim manufacturing front. 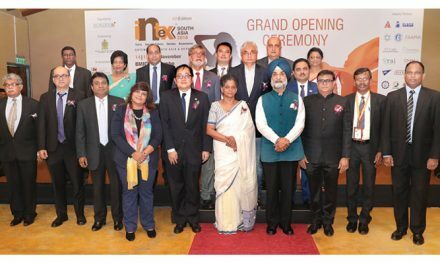 Six eminent speakers namely Ritesh Sharma, Reliance Industries Ltd.; Sartaj Singh Mehta, Pepe Jeans; Ashish Pateria, DIP & IP, GoMP; Anuraag S, Pencilbox; Manuj Kanchan, Jeanologia; and Dr. Christina Raab, ZDHC chose this medium to spread awareness about the transition in the denim industry. The topics opted by speakers were Fabric 2.0: Innovative Solutions to Cap New Age Demands, Upcoming Denim Trends, Investment Opportunities in Textile & Garment Sector in Madhya Pradesh, Experiencing Design with Day to Day Practices, Denim Industry Going Digital and Innovations in Denim Sector Through Chemical Management respectively. Fabcare Garments and Textile Machinery Pvt. Ltd. This is our first time at Gartex and footfall is pretty good. Customer quality base is good in comparison to other exhibitions where we have participated in, and that is the best part. This year our main focus area is garment dyeing because nowadays water is the main crisis for everyone. As they have been asked to put ZLD i.e. zero liquid discharge water treatment plant, which is going to be very expensive for everyone. So, the focus is cutting down to the water requirement, which we have been doing with our latest Splash series equipment. Now we are able to cut down the liqour ratio to 1:3 that means 1 kg of garments will take only 3 ltr water, which used to be 1:10 earlier. So that will be huge saving for everyone as they will be able to cut down the ZLD cost. The major saving is on steam, water, electricity as well as chemicals. The response is phenomenal here. So, we are pretty happy with the footfall and feedback we have received. People from Chennai, Bangalore, Andhra Pradesh have been to the show. On a whole it’s very good, and things are looking very positive for the future. We are promoting our 1N4S technology, which was introduced last year. We are making the demo available only for the real buyers, who are interested in the technology, so after seeing the samples here they can go to our Noida showroom and can witness it running live. With this technology we can feed in 2 mm four colour sequins together. We can feed reversible also. Besides, we have launched largest variety for loose beads, including 2mm beads with variety of about more than 42 colours. We have also displayed laser technology making it more affordable to the people. We have displayed all the product possibilities on garments with this technology here. We have also presented embroidery eraser technology and automatic bobbin changer – a robotic technology here. Some of the customers thanked us for the solutions, which we have provided, as what they were looking forward to. Response has been perfect, as we were able to do something to trigger the market. I believe Gartex has a very good future. Baba Textile Machinery (India) Pvt. Ltd.
Our focus is on new products, as old ones are not much in demand, and customers want new developments every day. Market demand has gone down by 25-30 per cent since last one year hence we are focusing on new products. Here for the first time in India we are displaying a four sequin machine. Though customers are coming in good quantity and also taking interest in our latest products but are not placing many orders. Last year’s show was held post GST implementation due to which it was down, and now the market is slow so it’s impacting the show again. Fashion is changing nowadays, and demand for embroidered sarees is reducing so it will take sometime for the market to improve. Recently, dollar price increased but we are not imposing any hike on customers, instead absorbing the same. 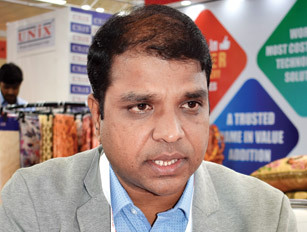 Indian garment export industry is suffering due to changes in TUF Subsidy and duty drawback rates, so until those issues are solved, how will the market improve. Foreign buyers’ orders are shifting to Vietnam, Pakistan, Bangladesh and also not only exports but domestic market is also down. We are displaying beads embroidery machine with dual sequins mixed chenille with high speed. So, in one machine all these features are given with speed of 1,000 rpm. We also have pearl attaching machine, rhinestone machine, digital printing machine, and sublimation printing machine. We were here last year also; and the show has improved a lot this year with increased no. of exhibitors and visitors. Though market sentiments are low, but customers are still visiting to have an update about latest technologies. Arrangement wise, management wise basically in all aspects the show is really good. When it comes to market, the exporters have still not received the duty drawback, GST refund etc. 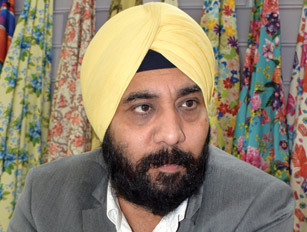 Besides, in our segment also value addition in terms of embroidery on fabric is getting reduced. People are working on different types of fabrics, printing, and embroidery is just a part of the same. Due to this, work/orders have reduced, but production has increased, so there is a lot variation in terms of demand. To cope up with this situation we are trying to offer wide range of new products to our customers. In future we expect to see good demand for dual sequins machines also. This is our third time participation in this exhibition, and we are more than happy with the feedback here. The best thing about this exhibition is that although the volume is not there in terms of footfall but quality is there. We don’t want unnecessary people coming here and enquiring about the machine but want genuine buyers so that’s what it is. We are happy with the response here. We have actually not come out with a particular theme as such. The idea is to showcase our existing fast selling machine Vastrajet – Direct to fabric with Konica head machine, which has been the no. one machine selling in the country for past two years. I am sure that this year also we will be increasing our lead further on that. Rolland happens to be a flagship product and also we are showcasing on AV our top-end product Metro. The concept is that anybody who is interested in a Metro machine, we are taking them to witness its live demo in our factory, which till now has received encouraging response. Overall, it’s been a good show for us. Our focus is mainly on the technology for denim wear basically,so are displaying some of the automatic machines range for existing technologies have been displayed here. Response has been quite satisfactory. This is our first time participation, and the organization is been above par and footfall has been really good. We got some good enquiries here. Market scenario is OK but yes dollar price fluctuations have affected our machines prices by resulting in its increase. Business wise last one year has been challenging sometimes and good sometimes. GST has made this industry to go for restructuring and making it more organised. But we would like to demand the govt. to enable faster and smoother documentation process while we import machines as well as while we sell equipments. Here we are displaying all new models of industrial sewing machines. From Siruba we have presented cylinder bed direct drive with basic models. Earlier, it was with double bottom trimmer but now we are offering direct drive with cylinder bed. Otherwise in L series models, we have introduced interlock so these are the new things from our side. Also from our own Orbito brand we have introduced Orbito bartack. At this year’s Gartex outstation customers are more when compared to Delhi NCR. Market right now is little bit slow, and if you compare the show this edition to last edition, we got more business last year. For last two-three months market is witnessing a slowdown. However, we are satisfied with the show as the footfall is good, but business is low as due of market situation customers are not willing to pay orders. We have participated for the first time and responses on all three days have been good. We found a lot of new faces and customers; basically serious ones and not too many students. Accessibility is better here as venue is in middle and facilities, infrastructure provided are also good. This is a new machine we have displayed and all our existing customers knew about it that our new machine will be launched here. The challenge we see in the market is that customers are not getting regular business. They have to shut down the factories for some time or skip shifts. In that case the print heads get damaged. So we have taken some special care and want to keep it confidential. Starting with our own customers we have launched a new machine with which they will save a lot of money. There are two different industries like large format industry where you print in large numbers and we are focusing on startups and customers with larger requirement getting smaller patches of orders and they can have multiple of these machines. We have already started getting bookings for the same. Cheran Machines India Pvt. Ltd. The exhibition is good. Throughout the show we had good crowd visiting our stall. Here we are displaying digital textile printing machine which we already launched last year but for the first time we are displaying it in a Delhi based exhibition where it becomes easy for Delhi, Kolkata and Mumbai based customers to come and check the machine running live. We invited a lot of people and most of them have been here. Some of the printing people basically exporters marked their presence in good numbers. 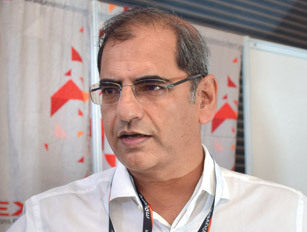 For last three editions I have been participating in Gartex and have seen them giving good service and agood show, they basically organising it very well. Systematically they are doing it so we are happy with the show. Market is going through a dull period right now. People are replacing their existing capacities one by one but new expansion is not happening. Exporters are changing to domestic market and also selling there. For our company we had good growth last year. Our technology, oval with digital has become the highlight in the industry. So, overall response and feedback wise we are happy with the show. Stitch Technologies India Pvt. Ltd.
Our focus is more on value addition in embroidery. Like we have come up with four colour glass beads so in one design you can do four colour glass beads. You can do four colour sequins of six sizes and you can do multi-cording, it’s a concept where you can do the value addition. To decorate a garment today you have all the options on the machine which is not possible by hand also.You can use finest to the thickest yarn on it, and there is no restrictions on the embroidery raw material.With multi cording you can handle six types of threads cords yarns. We want to encourage people to use embroidery instead of printing. Because printing will wash away but embroideries won’t. So, the concept which you see here is all about printing embroidery. With this technology you can embroider any picture taken from your mobile on a fabric within 5 mins. It’s aself-employment generating technology which has fast ROI. We have received good response from the customers visiting our stall. The ambience and quality of the show is really good, which plays important role in attracting visitors. Market has been in changing mode and normal embroidery concept is gone now. Cheap embroidery machines which does very low quality has reached low demand. Buyers want high quality embroidery but something different. The machine which we are displaying here is the same one we displayed last year. But it is with better speed, better stitch quality and latest technology software. Functions are same but the speed has improved, efficiency has improved with this mixed chenille machine for flat embroidery, aari embroidery, cording embroidery. When we compare show this time to last edition,Gartex 2018 have been good so far as many customers are visiting the same but only problem is that market itself is low and dollar price has increased so it’s not a very good time for imports. Organisation wise and infrastructure wise we are happy with this show. We are optimistic about 2019 for our company as well as industry as a whole. We are participating in this show for the first time and could see it shaping up well now. This exhibition is basically for digital and right now I feel there’s a lot scope for screen printing technologies in it. We are the only company participating in this segment so surely have an advantage in this exhibition. We have developed two machines smaller and bigger ones, which are displayed for the first time in Gartex, called Nanotex and Graficatex. Response here is good; both the machines attracted a lot of customers. Market is little slow but its picking up well. During last year we have grown up to base of 30 per cent more. Still the year is on so after Budget we will come to know how the future is going to be. As far as new product is concerned, Oval with digital is our new addition, which is already being launched in Tirupur. One of our machines is Negijet TX R-1900, Direct textile printer with Rico Gen5 – 8 heads (Speed 90-100 sq mtr/ hr) and 12 heads (Speed 120-130 sq mtr/ hr). The printer is designed especially for high quality, high productivity and high performance. Another new printer we have is textile dye sublimation printer from Mutoh, which comes in different speeds and widths. 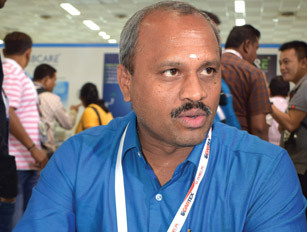 We have been successfully representing Mutoh as their distributors for last 22 years in India. Last year also we were here at Gartex, but the show this year is better. There are more participants and visitors’ turnout has also improved. 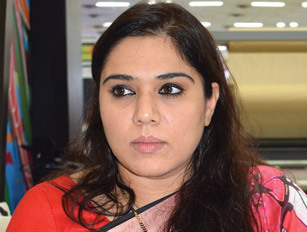 Buyers quality is also better and they are visiting from various parts of the country like Hyderabad, Gujarat etc. here. This year we can see more no. 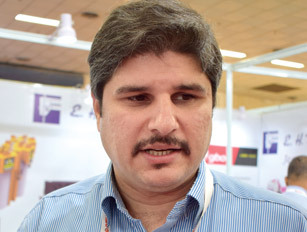 of exhibitors from digital textile printing industry which has dominated the edition. Market is getting better after GST so we hope to do good business this year. Another product which we are doing since last year is Brother DTG, which is a T shirt printer, and for that too response is very good. Our company supplies textile testing machinery through UK and globally. We are also manufacturer and supplier of small scale sample dyeing machinery. We have been operating in Indian market for quite some time, but it’s the first time we are exhibiting here. We are catering to market all over India through our agent. 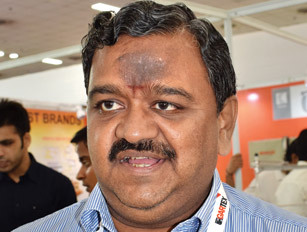 We feel that we are not getting the benefit out of the Indian market that we should,so we want to make a push to enhance our expertise into the Indian market, which is the reason why we have participated in this exhibition. Here we have brought two pieces of equipment. The big machine is textile testing machine for abrasion and plilling. The small machine is for testing rubbing fastness. We saw many visitors who visited our stall seeing how this machine runs, if they understand this machine then we could get good business. Overall, we are happy with response and just want to increase our exposure here in India. Our company is manufacturing printers since 2010. We are into industrial flatbed printing machines and have been doing digital signage printers primarily; eco solvent, UV printers and also textile printers, which are sublimation printers. So, we are pioneers with Reco heads as all are machines are with them for last 18 years.We are the only one in this exhibition showcasing Reco head printers. For the first time we have participated in Gartex, it’s a big learning curve for us about this market here in India. First day footfall was really good, after that it was a little less, but we got our niche of customers. There are people from North and Western India but nobody from South or Eastern India. Digital printing is a very price sensitive market, we are a manufacturer from USA, so we have a very big exposure of US based printers. Buyers are not aware of the actual better qualities which are available but having huge price gap between those and the ones they are already using. As the President to DMA, this was our initiative of coming into the Gartex. More than 21 mills have participated this time, in this exhibition and witnessed good footfall from NCR but people are also coming from other parts of the country. If the things turn good than next year I think 30-35 denim mills will participate in this exhibition. Most of the denim which is been produced in country is being consumed domestically. Almost 80-85 per cent is sold domestically and 15 per cent is sold as fabric to major markets like Bangladesh and South America. So, we thought to participate in an exhibition which caters to the need of local crowd or it is actual people who are doing the stitching, and NCR was a good platform to participate. 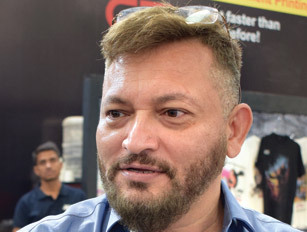 Hopefully, if things go well than sometimes in Mumbai also we will participate whether with Gartex or some other event to create more awareness of denim fabrics amongst the cutters. As a company we are looking more at sustainable fabric, which consumes less electricity, water and is more-friendly for the environment. Brands are looking for more of sustainable fabrics. We are presenting here Azurite, our patented technology in denims. Azurite product range is an indigo lover’s delight, as it employs indigo dyed weft yarns to complement indigo dyed warp sheets, thereby manifesting a truly premium and unique Blue Cast. The product line is targeted towards the true connoisseurs of denim who appreciate very authentic and saturated indigo fabrics. The product lives up to its tagline ‘Nothing is Bluer’ and has a global cult following. Various authentic denim brands and premium retailers use this line of fabrics in their fashion lines. Being a part of denim fraternity, Gartex is a good opportunity to showcase our product to our customers. Response is very good, a lot of footfall, people coming in representing brands, trade, different parts of supply chain. Currently, there are challenges in the demand side as well as supply chain. After demonetization and other govt. steps, gradually the market is settling down so we are looking forward to a good future. We are not really expanding capacities in fabric making but adding a lot in verticalization as we are adding a lot in garmenting and offering full vertical solutions to our customers. Overall, we are satisfied with this show, and will be here next year again. We normally participate in all the exhibitions where our segment is present. 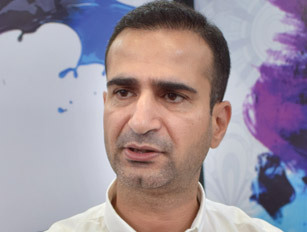 We are manufacturing denims since last 20 years, basically making 30-lakh mtr per month, and selling 50 per cent of our capacity in exports basically to brands. Rest 50 per cent is consumed by domestic market. As far as our new collection is concerned, we are making with BCI cotton, Modal and Tencel. We have shirting and bottom width range along with coating, knitting ranges, which are in demand these days. These days flat finishes and peach finishes are in trend. 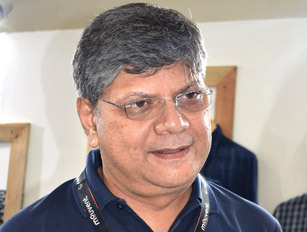 Adding denim segment to Gartex is really a good initiative. Footfall has been beyond our expectations. 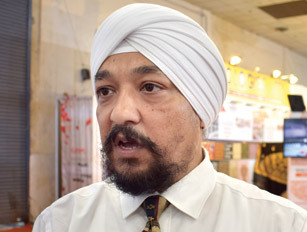 Buyers from all over India especially Kolkata, Ludhiana, Ahmedabad, Mumbai and Delhi NCR have been to the show. We are more than satisfied, and expect the organisers to hold such shows in Mumbai and Bengaluru also. Market is doing good, though demand is there but due to oversupply we are feeling pinch. Another issue is liquidity so we think it will take atleast one more year for the market to stabilize. We are associated with Denim Manufacturers Association, which comprises 31 companies. We are thankful to DMA for making us part of this show. We are having good customer flow here and also getting to know the new ideas and their requirement. We are catering to markets mainly in export and brands segments. Our collection is based on specific and revives yarn characteristics colours. We have net designs also and are in the special finishes and yarn colours. Peach finish is very soft finish, which is our USP. Trend for domestic market only knit design, soft feel are in demand. At exporters front they are very specific about the designs in terms of yarn characteristic, colours and washed down effects. We have very good collection in kidswear, which is the main attraction as we are the only one displaying it here. Response particularly to our collection is very nice at the exhibition. We usually participate internationally but through this show we are looking at domestic market, which is not having many trade shows. For us it’s a good opportunity to present to the domestic clientele, which we didn’t have earlier. Our theme is Denim for fun and freedom; we ship to customers all over world so we feel that Indian customers should also sense what we sell to customers internationally. Denim is moving forward, as in past it was more of causal but now it’s becoming more fun. Stretch, bistretch, a lot of new finishes, so our focus is about giving offer to the Indian market a much bigger plate of denim. In trends, big thing is sustainability as earlier it was about marketing & just talking about it, but now it’s serious. 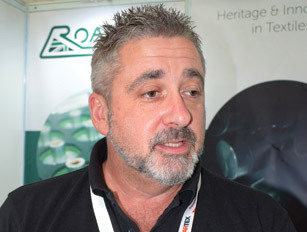 Today sustainability has become cost effective and efficient. So we have some sustainable products, which are made of using much less water, chemicals, cost is low but they are as good in finishes as the normal products and that is one big thing, which is in trend globally and in India. Other is stretch as people want the denim to be as closed to yoga wear or at leisure. It’s a good initiative by denim association who decided that we should have something here so we did. The show is really good and footfall is been pleasantly very surprising, much larger than we thought. Overall, we are satisfied with this exhibition. Most of the leading denim manufacturers have been participating in this exhibition, which is a great thing. We as a company are just trying to mark our presence here. 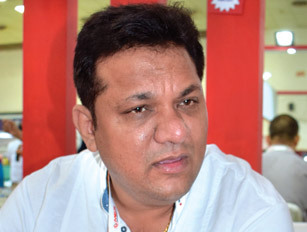 Our production capacity is 3 mn mtr a month, out of that 30-40 per cent is exported. The response is really nice, since all the denim manufacturers have come together; our customers and their customers have been coming again and again. Exhibition is focusing on my customers’ customers like cutters who sew the denim, who are coming to us with their queries and issues. New is our most sulfur colours like green, olive greens, grey, yellow, brown and this is something, which is going on in the market right now. The enquiry has been floating before just 10- 15 days and the exhibition has happened so people really liking our range here. Now the fashion is about knitted, like comfort denims and export collection are also on display. We met customers not only from Delhi NCR, but people from Kerala, Kolkata also have been to the show. LNJ is a part of RSWM group, and they are one of the largest multinationals in India. They are into yarns, PV Suiting fabrics and are also part of DMA. So, as their representative, we are showcasing our fabric collection here. Here it’s all about sustainability; nowadays everyone wants environment friendly things so that’s what we are doing, and we are promoting sustainable collection, which includes organic denims, BCI cotton denims and PCW i.e. 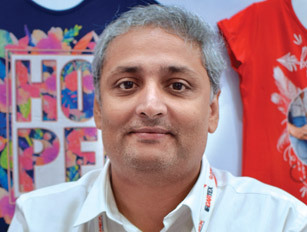 post-consumer waste denims that are made out of PET bottles and recycled denims. Response has been very good, better than what we expected. 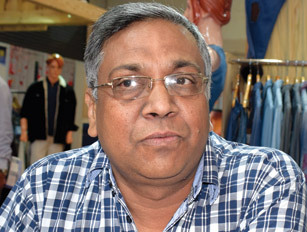 The show is successful as for Delhi local denim market no such thing was happening till now. 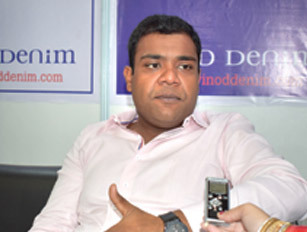 In denims, Delhi is the major wholesaler market. So, for them it’s a very good exposure, and we are not just showcasing the products for domestic market but also the ones, which we are promoting in brands. For the local people also it’s a very good exposure to go through the entire collection to the brands in international market. These days peach finish with net look, something, which is soft to handle, is in demand.